Iowa continues to lead the way in building partnerships with a broad cross-section of stakeholders to improve water quality and create new economic opportunities. 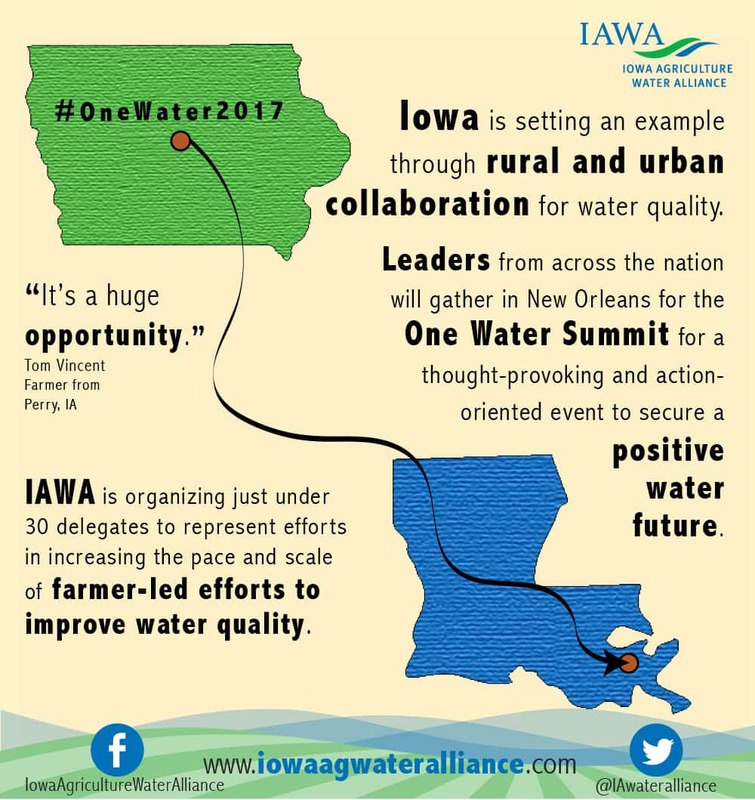 IAWA, in collaboration with the Iowa Soybean Association (ISA) and the Iowa Corn Growers Association, will lead a diverse, 30-member delegation to the One Water Summit 2017 in New Orleans, Louisiana, later this month. The delegation includes both expert and young farmers, city administrators, private companies, and other partners. The conference, convened by the U.S. Water Alliance, will give the group a chance to share Iowa success stories and network with attendees from across the country to gather new ideas. Iowa played a very influential role in last year’s Summit, being the only state to send a strong delegation that included farmers and other agricultural experts. Among the 2016 attendees was Harry Ahrenholtz, chairman of Agriculture's Clean Water Alliance (ACWA). Ahrenholtz says the Summit gave him an increased appreciation of the possibilities for rural and urban collaboration with water quality issues. Upon returning to Iowa, he worked with ACWA to make this collaboration a stated goal of the group’s annual work plan. Tom Vincent is another IAWA delegate who is looking forward to creating multi-layered solutions. Vincent, a crop and livestock farmer from Perry, Iowa, recently installed one of Iowa’s largest saturated buffers next to a turn-of-the 20th century drainage ditch. Vincent says he is looking forward to learning so that he can continue to set an example with further application of new, innovative techniques. Attendees at the 2017 Summit will again have input into the national conversation on what it will take to secure a positive water future, including both urban rural interests. They will interact and network with some of the nation’s sharpest minds representing business, utilities, communities, research, environmental experts, and policymakers. Georgia Vincent, owner and operator of Bunker Hill Farms, Inc.